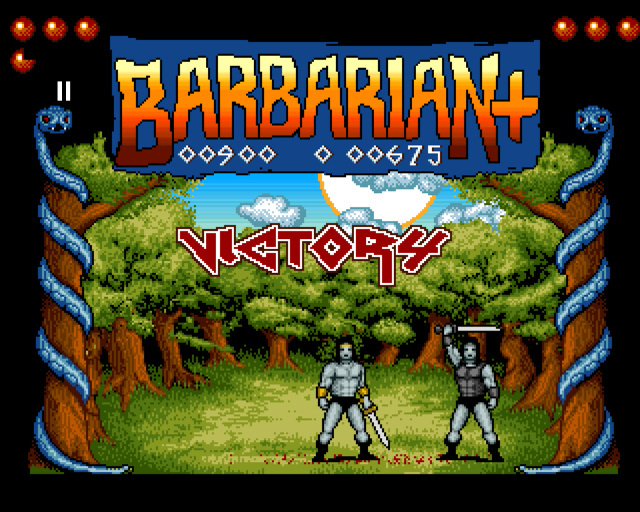 Classic beat'n'hack'em game "Barbarian - The Ultimate Warrior" got a fan-made facelifted remake, and is now available on Aminet. 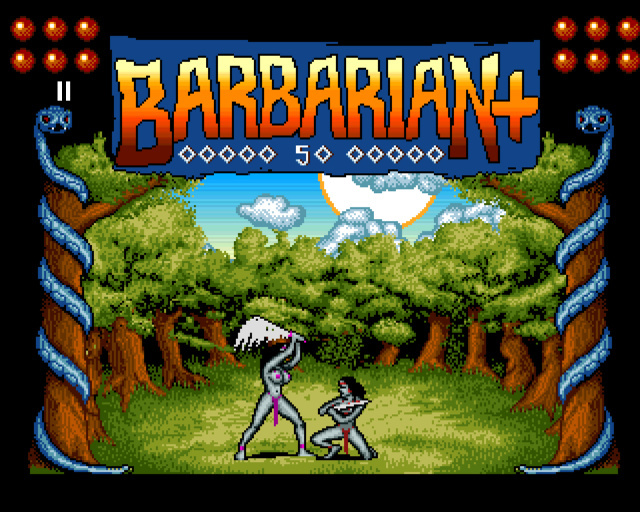 Some of you may have been following "Barbarian+"'s development history, with occasional artwork and news reports showing up in various places, but for those who didnt: "Barbarian+" is a remake of the classic game, written in AMOS by "Raster Wizards" Christophe Romagnoli, Simone Bernacchia and Colin Vella. It brings updated, refined graphics and sound, new warriors, new scenery, boss fights, cut scenes, one and two player modes, and demo and tutorial modes. The basic concept of course remains unchanged - let's say the "depth" of this game is... limited. But that's never been what "Barbarian" is about. It's always been about visceral fun, brutal fighting for real men, and protecting curvy Maria Whittaker from the dangers of everyday barbarian life. It looks gorgeous, as if literally every single pixel of the original game had been reviewed for improvement - which is probably the case indeed. A nice tutorial mode ("Controls") explains the warrior's moves and gets you immediately ready for close combat. Demo mode lets you watch computer opponents hurt each other for your viewing pleasure. Two of the new warriors - my god, what are these? The new scenes and warriors make a refreshing change, and some of the new sounds are just amazingly realistic. Apart from the general overhaul little new details have been added here and there. The game looks smoother than the original, probably due to more animation frames and faster screen refresh, but also maybe intentionally plays a little bit faster and more responsive. 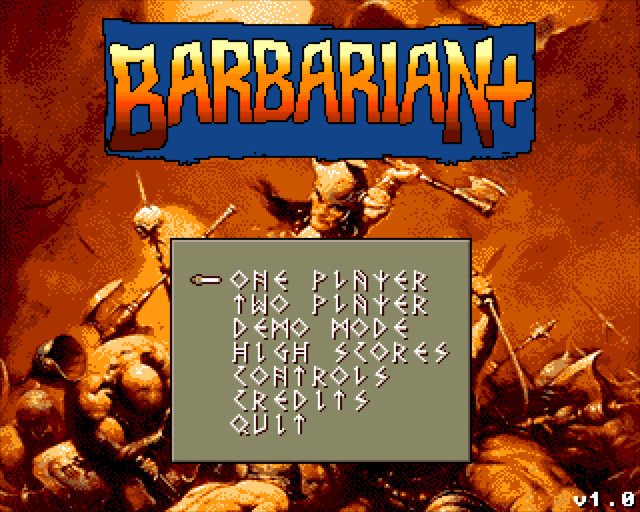 Overall "Barbarian+" does not explore new territory, but that's not what it's supposed to do. It's a beautiful tribute and a fine update to the original game that should not be missed. 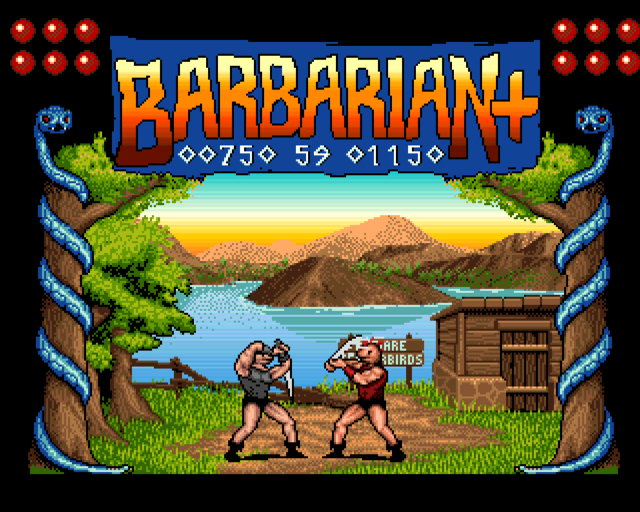 So far just a quick review, not to spoil too much - it's up to you to fight your way through "Barbarian+" and find out the gory details!